Are you a Classics major? A Graeco-Roman Pagan? Just interested in the Classics, language, and history? This book is a must for you. Out of all the books on learning Homeric Greek on the market today, this one is perhaps one of the most concise, clear-cut, and well-explained ones written. (I sampled quite a few trying to find a good textbook to prepare for my college classes.) 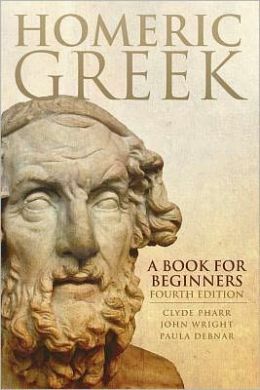 You learn Homeric Greek over seventy-seven short but effective lessons, with everything indexed, explained, conjugated, and laid out for you to absorb by the impeccable Clyde Pharr, teacher extraordinaire. This book starts out right away with the basics of Homeric Greek: the alphabet, pronunciation, accent marks, and more. After the introductory preamble is aside, you leap immediately into the guts of Greek grammar and syntax, picking up some initial vocabulary and lots of knowledge about conjugations, declensions, and pronouns. Within several lessons, you begin to read and translate passages from The Iliad in its original text. For much of the book, these passages are used as the bulk of the teaching material and all grammar and vocabulary lessons are built around the context of these passages. Yes, the textbook does begin quickly, and you do have to process a lot of information to get through the lessons, but because the content of the lessons is arranged neatly in a manner that is easy to read through, easy to process, and quick to refer to if needed (simply flip through the index at the back to locate important sections) it is not very difficult, after the first initial lessons, to keep up with the pace of the text. Because the textbook teaches primarily by using examples from one of the most famous and well-worn epics of all time, the lessons are memorable and perhaps more fun than those in textbooks where the exercises are contrived. You’re killing two birds with one stone: reading great literature and learning an ancient language and ancient script at the same time! That’s another great thing about this textbook: its introduction of the Greek script. Compared to the other books I’ve seen, the typeface in this one is very clear, larger than that of a standard textbook, and printed on gently yellowed paper so that it’s easy to identify and read the Greek letters. You won’t be daunted by trying to figure out if the letter is an epsilon or an omega: you’ll be able to read it clearly, and soon you’ll be zipping through entire lines of printed Greek text. I was particularly daunted by the prospect of having to learn the Greek script because I’d had a lot of trouble with it in the past, especially trying to make out the fuzzy letters on thin white textbook paper at size nine font — but this book is different. This book makes learning Homeric Greek enjoyable — not necessarily easy, but enjoyable. Thus, if you wish to learn Homeric Greek, this is definitely a good book for you. Expect to be challenged (in a good way) and be inspired by what you’ll find within its pages; it is definitely a superlative textbook in the world of Classics and one that I think I will be constantly returning to during my college years and beyond.